Bicycle licensing helps the police department quickly return bicycles to the rightful owner in the unfortunate event it is ever lost or stolen. Our goal is to return all bicycles, however each year, numerous unclaimed bicycles are eventually sold to auction after 90 days. 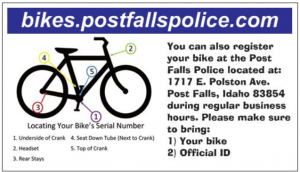 In addition, Post Falls City Code - under Title 10, Chapter 10.36, Article 1 - states it is unlawful for any person to operate or use a bicycle upon any of the public thoroughfares or highways within the city without first registering their bike with the police department at no charge. Police Department: Bicycle licenses are issued at the police department during normal business hours Monday through Friday between 8:00 a.m. and 5:00 p.m. You must bring the bicycle you want to license with you. After a short application is completed and the bike’s serial number verified, a decal is affixed to the bicycle in an inconspicuous location. Click the send button for automatic electronic submission to the Post Falls Police Department. 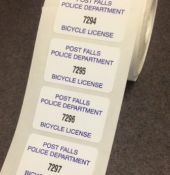 After processing, your unique bicycle license decal will be mailed directly to you. Please affix it in an inconspicuous location on your bicycle. For questions, please call our nonemergency line at 208-773-3517. Please complete the following fields to register your bike. Please select and upload a image of your complete bike.